A fitting addition to the legacy of a sadly missed talent. Through the early to mid 1990s, when melodic rock was going through a difficult period, I found myself turning to different genres of music for solace. During that time blues guitarists were one of my most popular fall backs. The likes of Stevie Ray Vaughn, Walter Trout, Robert Cray and Jeff Healey all gave me lots of pleasure and I made a point of trying to catch them all when they toured. It came as something of a surprise when I received this Jeff Healey package because I was reminded that it is actually five years since he passed away at the very young age of 41. 3 CDs and 2 DVDs is a lot to get through in the few weeks I had available for preparing this review, but I actually enjoyed every minute, found myself playing it a lot more than I expected and was transported back in time 20 years to an experimental musical period in my life. The three shows included in the set are taken from European tours in 1989, 1995 and 2000. The two DVDs are basically visual versions of the CDs but also include all the between song banter, removed from the CDs to concentrate on the music and shorten the overall running times. Each show was recorded in Germany where Jeff had a very loyal following and great success and it is interesting to note the differences in his appearance as the years pass by. One thing that does not change however is the passion and desire attached to each performance. It is hard to believe that the 1989 show features a 22 year old Healey, already accomplished and confident, fresh from his appearance in the Patrick Swayze movie 'Roadhouse'. 'When The Night Comes Falling From The Sky' (written by Bob Dylan) features in the movie and is also included in this show alongside Healey favourites such as 'Confidence Man', 'Angel Eyes' and 'See The Light'. Backed by long-time band mates Joe Rockman (bass) and Tom Stephen (drums), Healey exudes charisma and has a natural ability to display fire during the more energetic workouts and heartfelt emotion during the passages of melancholy. When we get to the 1995 show guitarist Pat Rush has been added to the touring line-up to help fill out the sound and relieve Jeff of the burden of carrying all the guitar duties on his own. He gets his own spotlight moments during the show, especially during the down and dirty version of the Lennon/McCartney song 'Yer Blues', when his slide fills are the perfect compliment to Jeff's fiery soloing. Once again Jeff shines throughout and though the 15 minute version of 'See The Light' is slightly self-indulgent, it is still a showcase for some excellent guitar histrionics. Finally, the 2000 show, which now finds Philip Sayce handling the second guitarist role. The set has a familiar feel about it as it again features versions of 'Confidence Man', 'Angel Eyes', 'See The Light' and The Doors' 'Roadhouse Blues'. The detailed booklet explains that Jeff was suffering a little with health issues during this show and it is also the last of a lengthy and difficult tour. You'd hardly notice the way he attacks every song passionately, never seeming to give anything less than 100%. The filming and recording is everything you need for a blues show. There are no rapid edits and by concentrating on individual performances it gives the viewer/listener more a feeling of being there. The basic guitar/bass/drums/vocals format allows for a clearer sound meaning every element of the band has a distinct clarity. If I have a preference it is for the 1995 show. I just think that the performances have a greater depth, and because I actually caught the band myself on that tour, it brings back some good memories. Jeff also shines during some great acoustic segments like 'Me And My Crazy Self' and 'Angel Eyes', which are not included in either of the other shows. 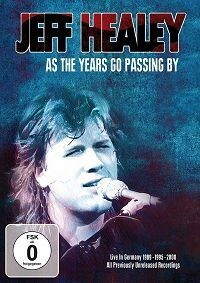 For Jeff Healey fans there is much here to enjoy. Everything is completely live and there are no studio 'touch-ups'. This is a great package but I'm not sure about its appeal to the casual listener as I still think some of the cheaper studio releases would be a better investment as a starting point. A fitting addition to the legacy of a sadly missed talent: for when AOR and metal just does not suit the mood.